alaTest has collected and analyzed 460 reviews of Binatone Luna 1105. The average rating for this product is 4.3/5, compared to an average rating of 4.0/5 for other Cordless Phones for all reviews. We analyzed user and expert ratings, product age and more factors. 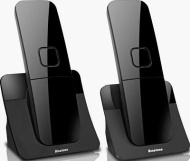 Compared to other Cordless Phones the Binatone Luna 1105 is awarded an overall alaScore™ of 89/100 = Very good quality.
" Like this phone, has great features and love the fact it can be placed on the holder either way round so when buttons facing inwards it doesn't look like a phone. "